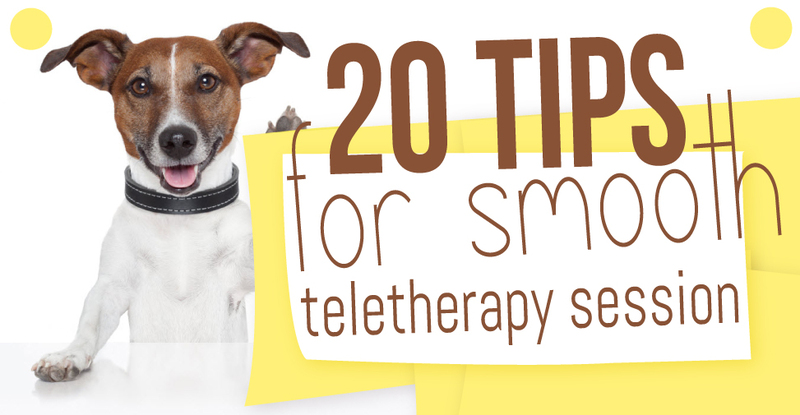 The TheraPlatform Team has a few tips to help you make a teletherapy or telepractice session as smooth as possible. These tips are useful when using the TheraPlatform, but they are applicable for any videoconferencing tool you might use when providing teletherapy or telepractice services. Learn how to use the platform—practice with your friends or family members before you meet your clients live online. Learn all the technical requirements for using the platform, including required internet speed, etc. Learn basic troubleshooting tips such as how to select the appropriate microphone in the settings. Make sure you and your client do not use any other video tools (such as Skype) during the session. All other video tools must be turned off, so the videoconferencing platform can work properly (otherwise you will not see each other). Make sure that neither your computer nor your client’s computer runs updates or installs software during your online session. It would slow your connection. Do not conduct a session on a brand new computer, because the first time you turn it on, it will likely begin updating already installed programs and installing new programs automatically. Keep in mind that it may take a whole day for the computer to install and update everything. This tip also applies to your client. Make sure that no one at your house or the client’s house tries to stream videos (such as Netflix) or play online games during a session, because it can slow the connection. Make sure that neither you nor your client leaves too many browsers and websites open, especially the ones that have online games. It is better to have one browser with a website open at the time. If you need to access several websites during your session, keep a list of the links handy in a Word document and be ready to copy/paste one link at a time, as needed. If you have too many websites open, your connection can slow down. Make sure that your background is minimalistic, not distracting. It will help your camera focus on you better, and it will help your client to focus better too. Consider positioning your computer/camera against plain wall or hang a plain piece of fabric behind you. Consider wearing plain, solid-color shirts (pastel or jewel tones) and avoid bright colors or stripes. Very bright shirts and shirts with busy patterns (stripes) can create a distracting optical illusion. Avoid wearing shiny jewelry, as it can be distracting. Avoid wearing jingly jewelry, as the microphone will pick up the noise, making it difficult for the client to understand you. Limit background noise, including fans, barking dogs, phones, etc. Communicate with your client in advance to ensure that he or she has the right equipment and set up for the session and feels comfortable using the computer. Forward these tips to your client in preparation for the session. If you must type progress notes during session, consider muting your audio, as keyboarding is loud, especially if you both use headphones. If you decide to use headphones during teletherapy, consider headphones with a background-noise canceling feature. If you decide to screen-share websites during your session, make sure you review the particular site ahead of time. Many online games and websites include ads that are distracting or inappropriate. Allow yourself some time before each session (at least 5–10 minutes) to stretch and prepare for next client. Consider offering your new client a free short session to test everything and briefly educate him or her about how you will conduct the session. If you have any tips you find helpful for conducting teletherapy sessions, please share them with us and we’ll add them to our list. Online therapy has been proven to be as effective as in-person therapy. Online therapy is a method of delivering therapy, such as speech therapy, occupational therapy, or mental health counseling, via the Internet over a secure and HIPAA compliant video conferencing.